I enjoy using the specific time of ‘soon-ish’ – and agreed re: the excellence of Chinese Democracy. I think of it as an Axl record (as opposed to GNR) but what a record! Oh, I totally agree. I actually wish he had released it as a solo record. I understand he wouldn’t have been able to strong arm Best Buy with a solo record, but I think people would have dug it more if it didn’t have the expectation of being a GNR record. Those two are my favorites on the album, for sure. I think “Better” actually works as a GNR song. I haven’t actually listened to it in a year or two – you’ve inspired me to break it back out tomorrow, my thanks! It’s definitely a “grower.” I remember when I first heard it, I was super-disappointed (which is the general consensus). But Axl did a lot of good work on that album. Anyway, let me know if anything stands out/catches your ear after you give it a new listen. After another listen+a half over the last couple days, it’s a solid Axl Rose record! It feels like there are thousands of tracks on each song so it’s not exactly ‘under-produced’ but there are some strong moments. Other highlights for me: The title track (actually the whole first half of the album for that matter) & the ‘should have been a James Bond theme’ If the World! The production is one the most fascinating parts of that album. There’s three or four different guitar tones in many of the songs! I really wish someone would write a book about the recording of this album. And you’re right, “If The World” should have been a Bond theme. 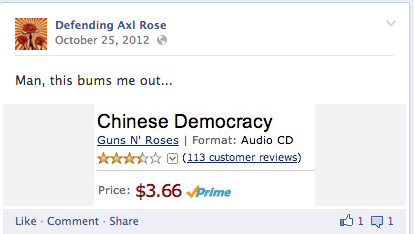 Glad you enjoyed Axl’s solo album. I really love that album. Its a shame people dismiss it so easily. I wish they’d went through with the whole “triple album” thing.